Genesis Desert Demolition (USA/Europe) "Road Runner" in 04:18.42 by Ferret Warlord. Desert Demolition captures the theme and style of the popular Warner Brothers Road Runner shorts to create an entertaining game where the stage hazards and layouts change based on your character choice. 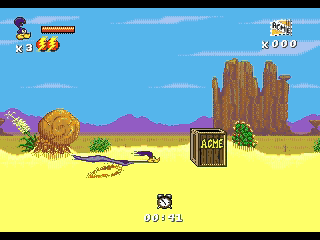 This run features Road Runner, who uses his insane speed to avoid or even plow through Wile E. Coyote's many traps. For a Wile E. Coyote version of the game by the same author, click here.